1. What are blister fried peanuts? We take our super extra large blanched peanuts, boil them in water for around 10 minutes, let them drip dry for a few minutes and then deep fry them in canola oil while they're still wet. This causes a blister to form, on the peanut, giving them their unique flavor and texture. 2. How do peanuts grow? Here in Bertie County peanuts are planted in about 1 1/2" deep rows, 36" apart at a rate of around 100 lbs. of seed per acre. 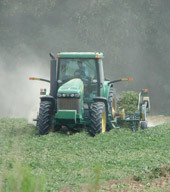 Peanut plants, when mature, range from 12" to 18" tall and about 18" to 36" wide. During the fruiting season these plants have small yellow blooms from which a long, narrow structure we call a "pin" emerges. These "pins" grow toward the ground and when they touch the ground they begin forming a peanut which actually grows below the surface of the soil. 3. When do you harvest peanuts? We normally begin harvesting during the latter part of September and hopefully finish the first of November. 4. Why are your peanuts so big? There are several types of peanuts, runners, Spanish, Valencia, and bunch. Our bunch varieties are large seed and we only use super extra large selections in our blister-fries. 5. Can we buy your peanuts at other stores? Yes. However, since we are very particular about what retailors carry our products we are very slowly adding to the present number. If there isn't a retailor near you, rest assured that we have a small retail store here in Windsor. So if you're in the area drop by and see us here at Powell & Stokes. 6. What is 'Pod Blasting' and why do you do it? One of the most accurate methods to determine peanut maturity is to shell the peanuts and look at the color of the inside of the shell. The darker the color, the more mature the peanut. The most mature will be practically black while the least mature peanut will be pure white. North Carolina State University developed a method of actually sandblasting the outside of the hull, which is faster than shelling the sample. The process removes the outside covering of the shell and reveals the maturity colors you see when the peanuts are actually shelled. After they have been "pod blasted", the different colors are separated and we (Richard Rhodes) determine what percent are ready to dig or how long it will be before we should dig. By waiting and digging 10 days to 2 weeks later, at the optimum time, our yields can increase 3 - 500 pounds per acre or $100 to $150 per acre. On the other hand, waiting too long will cause the pins to shrivel and dry out, causing the peanuts to shed and fall off when dug. 7. Why should we refrigerate our peanuts after we open them? Once a jar of peanuts is opened, oxygen begins to cause them to lose their flavor. By refrigerating them you slow down the process. 8. How long can we keep our peanuts before we eat them? 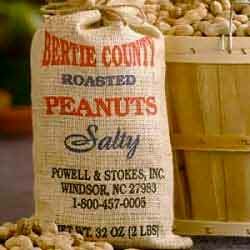 To enjoy the best flavor of our roasted peanuts they should be eaten soon after receiving them. Our Blister Fried Peanuts and candies should be eaten within 1-3 months. Raw peanuts should be refrigerated and will last several months if in a glass or air-proof container. Both raw and blister fried can be kept in a freezer for several years and not loose their flavors (don't try to freeze raw or roasted in the shell peanuts). Want a treat? Eat some Blister Fried while they are frozen. 9. What are the yellow wagons we see everywhere in Bertie County? We have 94 drying wagons here at the warehouse. Farmers load these with green peanuts after they have been separated from the plants in the fields. Each wagon has a vent in the tailgate. We attach the wagon to our dryers via that vent and then blow hot air up through the peanuts. Peanuts must be dried to 10% moisture in order for them to be sold or stored. 10. Peanuts are full of fat, how can they be healthy? It depends on what kind of fat we are talking about. Peanuts are high in unsaturated fat, low in saturated fat and contain no cholesterol. For really good nutritional information, contact the Peanut Institute at 1-888-8PEANUT or visit their web site at peanut-institute.org. 11. 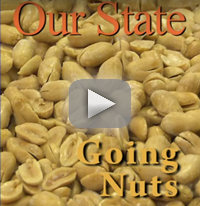 Don't farmers pour gallon after gallon of chemicals on peanuts making them unsafe to eat? We've been in the farm supply business for a long time; and for the most part, our farm customers are as tight as ticks. 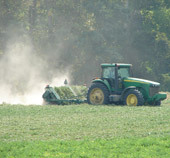 With the farm economy the way it is, no farmer is going to use anything on his crop unless he absolutely has to have it. It is sometimes necessary for us to recommend the use of EPA approved products for grass or insect control. Without these products, you wouldn't have the bountiful, safe crops we produce year after year. Thanks to our farmers we enjoy the cheapest and healthiest food in the world. 12.	International Orders - do you ship peanuts to international destinations? Yes, however, International Orders require special handling and incur higher shipping costs. In addition, your order may be subject to special import taxes or duties when your order is delivered and will be influenced by the currency exchange rate in effect at the time of importation. Quotations are issued by Powell & Stokes in U.S. dollars and include the cost of the product(s) you'd like to order and associated shipping costs. Importation taxes and duties which may be due on delivery and currency exchanges involved in the transaction shall remain the sole responsibility of the purchaser. These fees (if any) may result in additional costs beyond those quoted by Powell & Stokes.